I’ve really been craving Italian flavors lately, WAIT…I think I’m craving the idea of Italian flavors (meaning, dimly lit authentic little Italian restaurant, good red wine, Frank Sinatra, cheese, and garlic). What’s awesome about this health journey I’m on is recognizing the flavors OR ideas (in my brain) that I’m craving, appreciating them, and understanding what they mean so I can satisfy them in a healthy way. Amazing the very, very close relationship between your gut and your brain. That’s a whole other post. 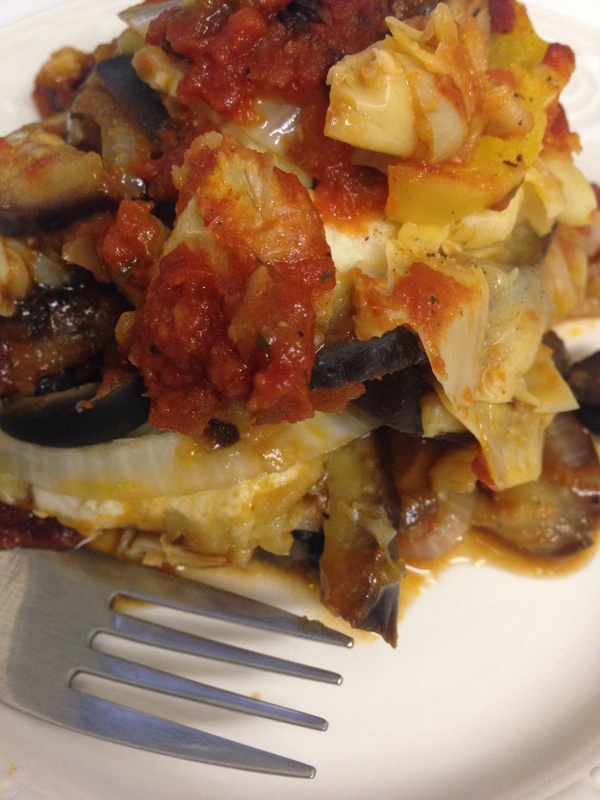 These cravings were the inspiration for my creation last night: Artichoke Olive Pasta. 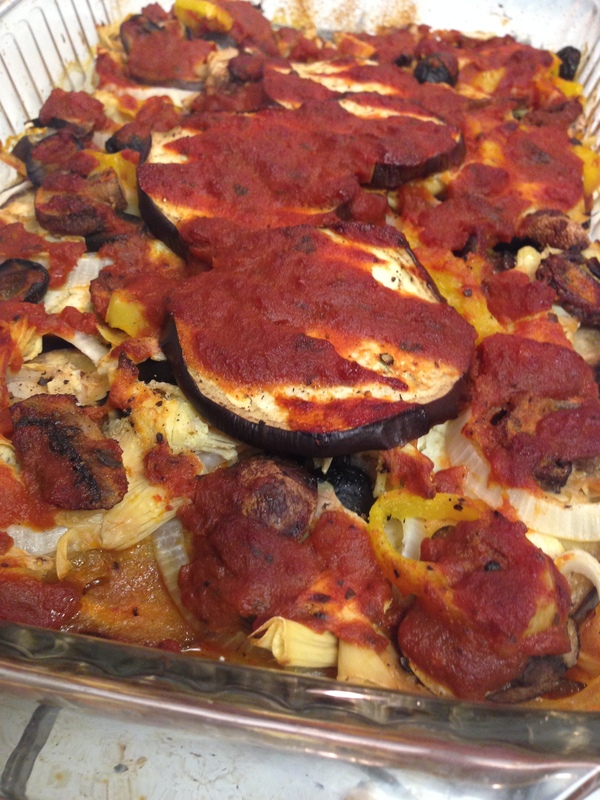 I had pre-roasted spaghetti squash in the fridge, which made this dish super quick. I squeezed the water out of the artichoke hearts over a colander (they don’t need to be “pretty” so I literally smash them up in my hand). I melted about 1 TBSP of coconut oil in a sauté pan, and added the diced onion, sprinkling with garlic powder, kosher salt/pepp. After about 5 minutes, I added the squeezed artichoke hearts and continued stirring so they could warm up. 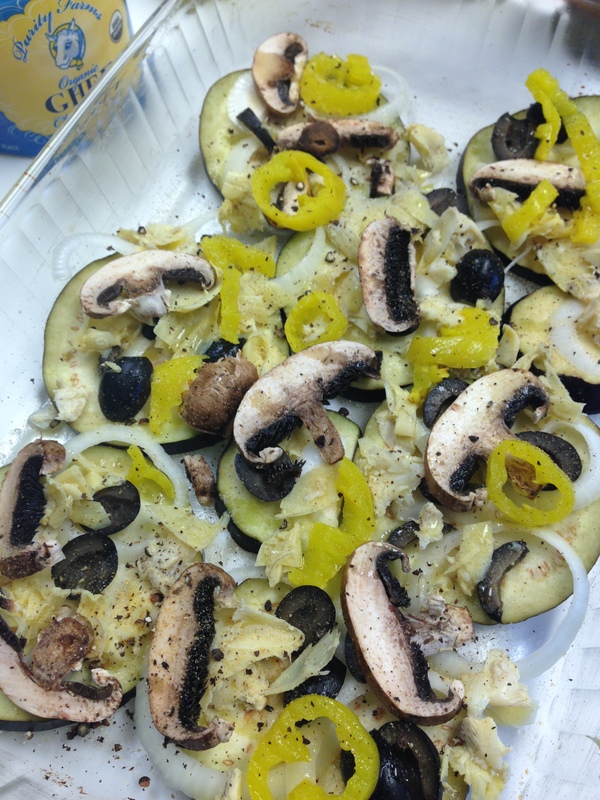 Last, I added the black olives, which I’d sliced in half lengthwise. 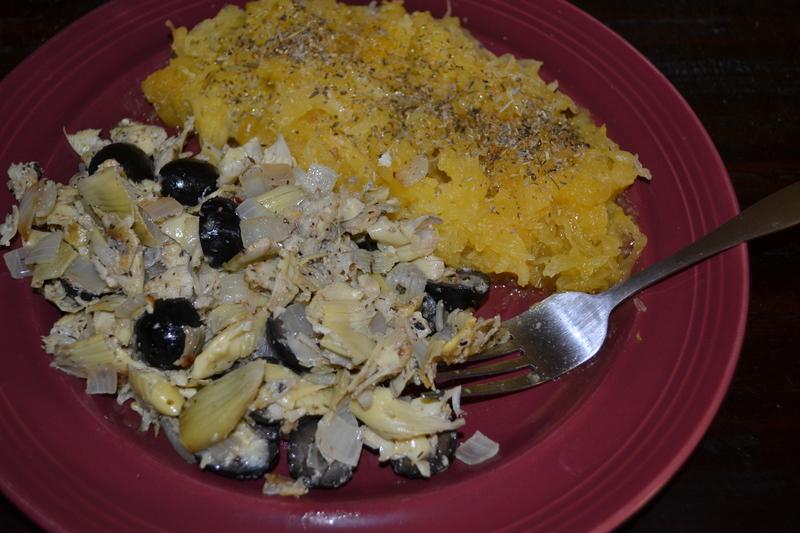 I turned the heat down low to keep everything warm, and microwaved a pile (yes, a big pile) of spaghetti squash. once the squash was warm, I generously sprinkled with Herbes de Provence, and a drizzle of olive oil (to add to the Italian flavor). 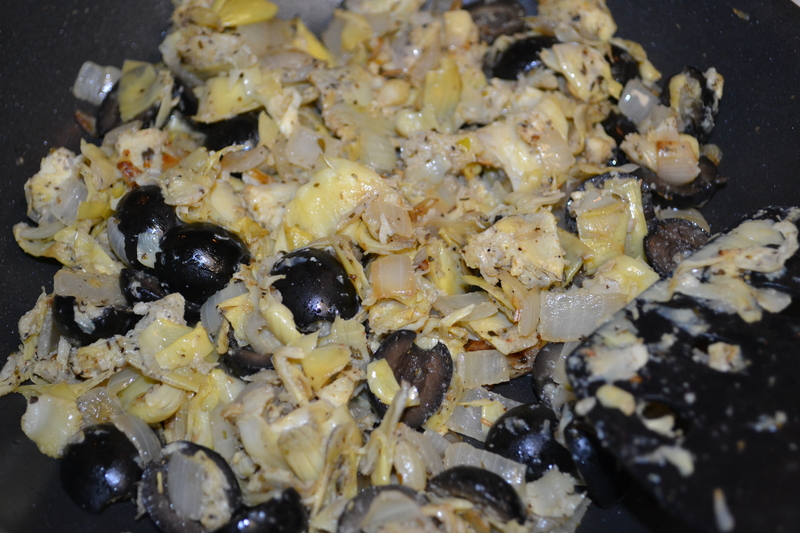 Then I added my artichoke olive stir-fry, and voilà! 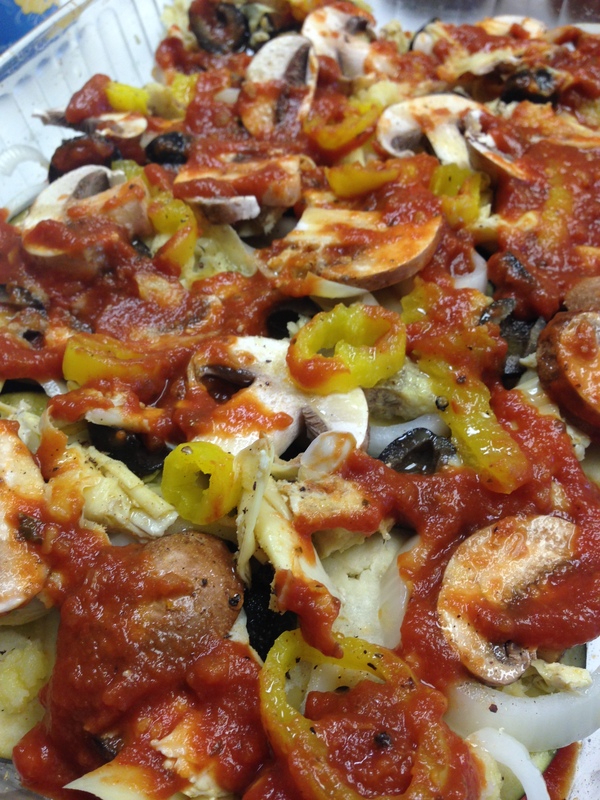 Italian flavors abound!